The hotel is built on the banks of the Preguicas River, set in pretty gardens. This is a peaceful location in which to relax between visits to the national park at Lencois Maranhenses, famous for mile upon mile of pale sand dunes interspersed with blue and green lagoons, a photogenic landscape that attracts visitors from all over the world. Rooms and suites are spacious and simply styled, comfy and with a good range of amenities including air conditioning, TV, minibar and en-suite bathroom. Each leads out to a covered terrace where a hammock is strung between posts, an ideal place for a doze. The restaurant provides a broad range of dishes to suit all tastes, and the breakfast sets you up well for the day ahead. The bar is a good place to relax over a drink and get to know fellow guests, and includes a games area. Other recreational features include a swimming pool, a gym set beneath a thatched roof which is open-sided for a welcome breeze, and a massage area. Kayaks are available free of charge if you want to explore to the river. Open: Porto Preguicas Resort is open all year. Location: The resort is by the Preguicas River, about 2kms from the centre of Barreirinhas town in Maranhao state, north eastern Brazil. Rooms: There are 72 guest apartments and suites. All have air conditioning, ceiling fan, cable TV, Wi-Fi, minibar, hairdryer and en-suite shower room. Each has a terrace with a hammock. Rooms can sleep up to 4 people. Suites are slightly larger and can accommodate up to 5 people. Activities: Relax by the pool, take part in a game of beach volleyball, watch a pottery demonstration and go kayaking, all free of charge. 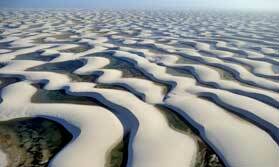 You can visit Lencois Maranhenses National Park with its sand dunes and lagoons. Staff at the tour desk can help you arrange excursions. Facilities: There are 2 swimming pools, a sunbathing area, restaurant, lounge bar and games room, gym, massage area, shop and gardens. The hotel has a children’s playground. Dining: Breakfast is served buffet-style in the restaurant. At other times you can dine on local and Mediterranean-inspired dishes including paella, pasta and pizza. Health: Barreirinhas is a malarial area. Communication: There is Wi-Fi internet access, though this is not always reliable. Notes: Very few members of staff speak English. Visit one of the most beautiful places on earth, one of Brazil's natural marvels. This is a place like no other.